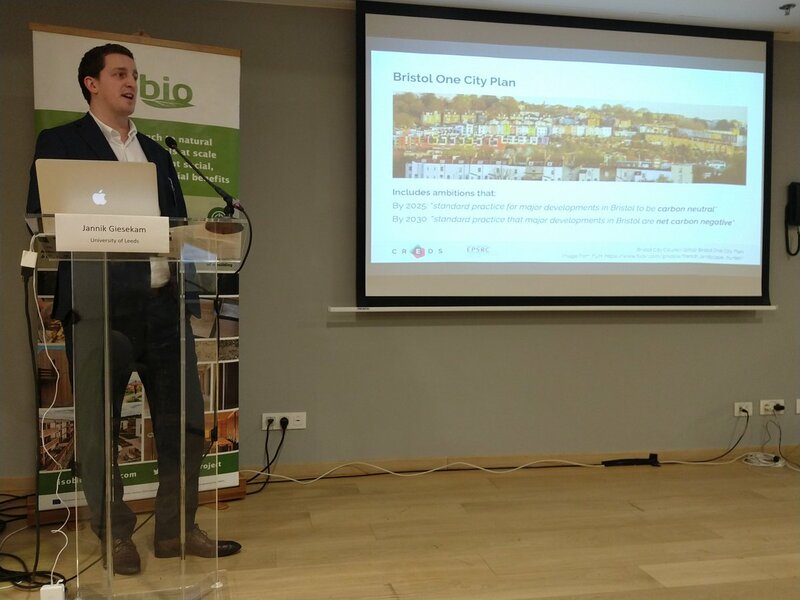 On the 29th January I presented at the ISOBIO project closing event in Brussels as part of a session on embodied carbon policy in European construction. My presentation focused upon recent developments in the UK and the slides can be downloaded here. All other presentations from the day are available from the event website. I recently co-authored a new article in the Journal of Industrial Ecology. The article considers the role that strategies to improve material productivity could play in meeting the UKs 4th and 5th carbon budgets. On the 1st November I presented at an ASBP and Green Register event on Delivering Healthy Buildings in Bristol. My presentation focussed on reducing embodied carbon and the slides can be downloaded here. 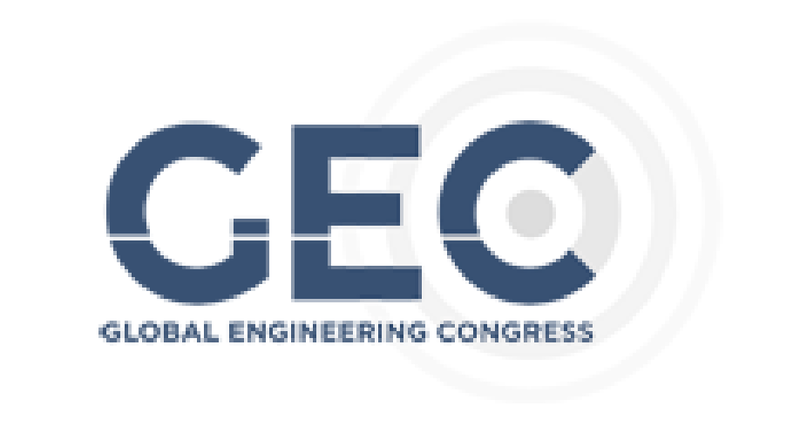 At the end of October I attended the ICE Global Engineering Congress in London. On the 24th I chaired and presented in a session on carbon reduction in the built environment, also featuring speakers from HS2 and Landsec. You can watch a recording of the session or download slides from my presentation. On the 25th I moderated another session focussing on climate action, featuring talks by Keith Clarke and Diana Guzman-Barraza. On the 11th October I presented at the Community Housing Cymru One Big Housing Conference in Wales. 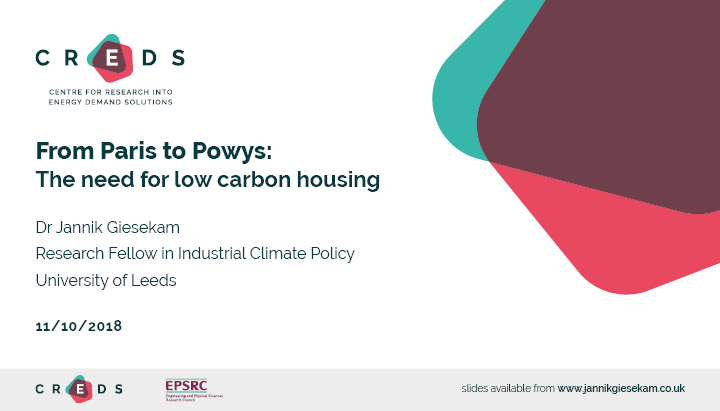 My presentation focussed on the need for low carbon housing and the slides can be downloaded here. I recently co-authored a report for DEFRA exploring the link between resource use and carbon emissions. This involved calculating the UK’s material and carbon footprints and developing new carbon-based metrics of resource efficiency. These metrics were used to explore the extent of decoupling of raw material consumption from economic activity and decomposed to enable comparisons across sectors of the economy. A short summary of the work can be found in this CIEMAP Briefing Note. The full report is available from the DEFRA science & research projects site. On the 14th June I presented at the Woodbuild Wales conference in Cardiff. 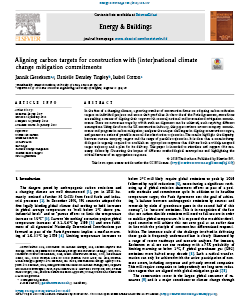 My presentation focussed on the role of timber construction in meeting carbon targets and the slides can be downloaded here. I also recently co-authored a new article in Climate Policy. 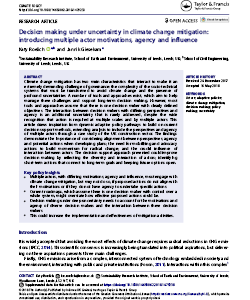 The paper explores decision making under uncertainty in climate change mitigation through a case study from the construction sector. 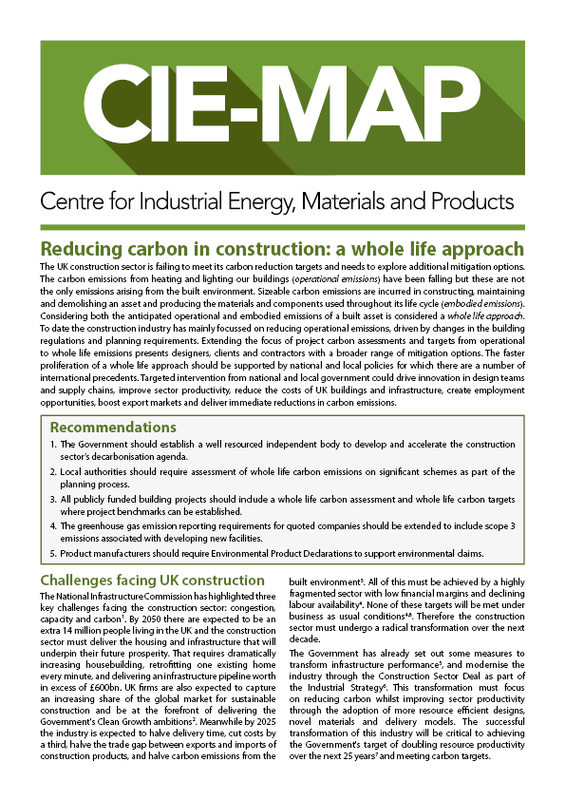 I also recently authored a new CIEMAP Briefing Note - Reducing carbon in construction: a whole life approach. The note explains why the UK should adopt a whole life approach to reducing carbon in construction and includes recommendations for supporting local and national policies. 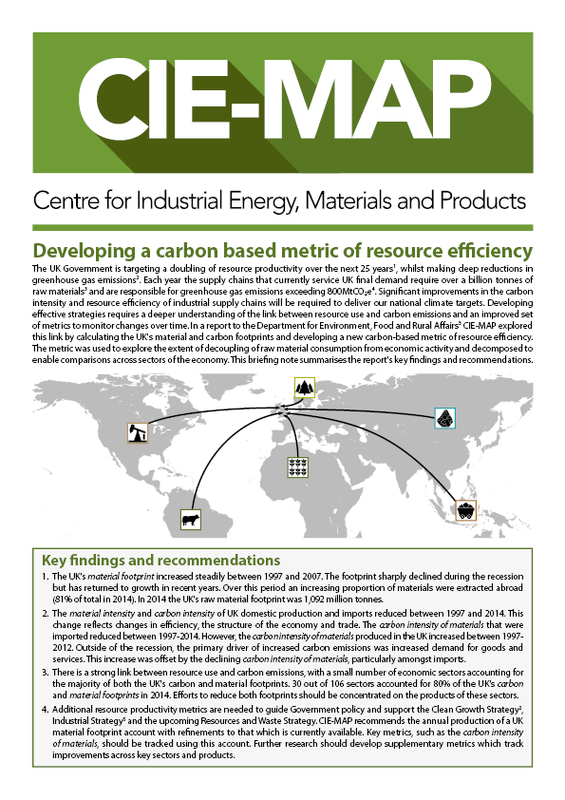 It is one of a series of 10 Briefing Notes summarising the outputs of the Centre for Industrial Energy, Materials and Products. 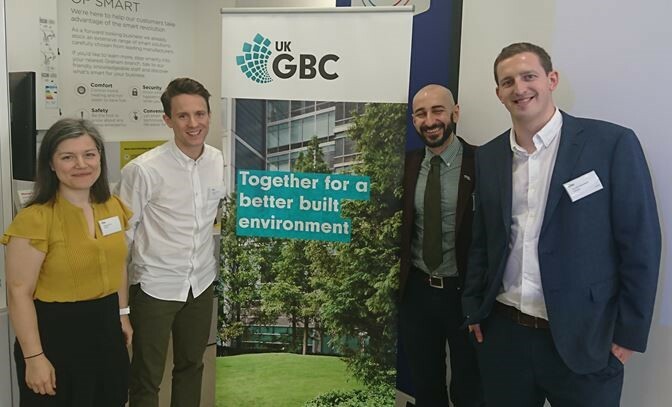 On the 19th April I presented at a UKGBC event on aligning carbon targets in the construction industry. My slides can be downloaded here. The event was sponspored by CIE-MAP, Edinburgh Napier University and Landsec, and featured 13 speakers across a range of topics related to carbon reduction. A full write up of the event should be available shortly. Earlier this year I had a new journal article published as part of a special issue of Energy and Buildings focussed on embodied carbon and energy. The article provides a brief review of current carbon reduction commitments from the UK construction industry and discusses the challenges associated with developing a common sectoral decarbonisation trajectory. I have also co-authored a chapter in a new book on Embodied Carbon in Buildings, focussed on applying circular economic principles to reduce embodied carbon. In March I presented at Ecobuild as part of a panel session discussing a recent UKGBC project to assess the sustainability of the UK built environment. The session was chaired by Julie Hirigoyen, chief executive of UKGBC. Other speakers include Adrian Gault (CCC), Bill Dunster (ZEDfactory), Louise Clarke (Berkeley Group) and Stephanie Wray (President of CIEEM). The slides I presented can be downloaded here. For older news articles please click here. 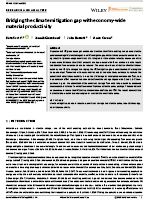 Wiedmann T, Crawford R, Seo S & Giesekam J (2013) The Industrial Ecology Virtual Laboratory and its application to sustainability and environmental engineering - the case of low carbon living. Sustainable Engineering Society (SEng) 2013 Conference 18-20 September 2013 National Convention Centre, ACT, Australia. My research focuses on the role of material efficiency and industrial energy demand reduction in securing a low carbon future. My main research interests are in mapping economy wide material and energy flows, embodied carbon and materials innovation in the construction industry, and the automated assessment of microgeneration potential. Check out my presentation slides and publications for more detail. If you're interested in collaborating on a project please get in touch. In science knowing a lot of stuff is not the point...knowing a lot of stuff is there to help you get to more ignorance.